Holds AR15 type receivers from the inside. Can't crush receiver or mar finish. 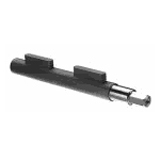 Allows turning or threading end of barrel in lathe without removal of receiver, sight base, gas tube, or hand guards. Facilitates removal of barrel using either a lathe or vice. 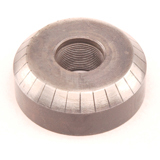 Can take up to three times the recommended barrel nut torque without distortion of receiver. Tool Extends from rear of receiver with provisions for use in conjunction with any lathe chuck, vice or 5/8" wrench. Made from tool steel heat treated, lazer marked, and black oxide finished. Available for K and L frame Smith & wessons. Basicaly tool replaces fram when barrel fitting. Use to 1. check threads on new handel 2. Hod threaded end of barrel in lathe jaws to turn dia. of barrel. 3. Clock barrel to proper timing. 4.measure and cut new barrel to correct barrel/cylinder gap. 5. Remove threads from position of frame between reciever and cylinder.